Rockland, ME – Forecasts for rain, possible thunderstorms and gusty winds postponed the start of the 43rdAnnual Great Schooner Race on Friday, July 6, 2018. About three hours after the scheduled start, the Maine Windjammer Association got the race underway at approximately 1:15pm. Eleven boats raced from Gilkey Harbor in Islesboro to the finish line at the Rockland Breakwater Lighthouse. The Schooner Heritage won the race, taking home the Cutty Sark Award trophy. In keeping with tradition, captains Doug and Linda Lee were presented with the trophy and the coveted “Eat My Wake” flag, by the 2017 winner of the award Noah Barnes, Captain of the Schooner Stephen Taber. 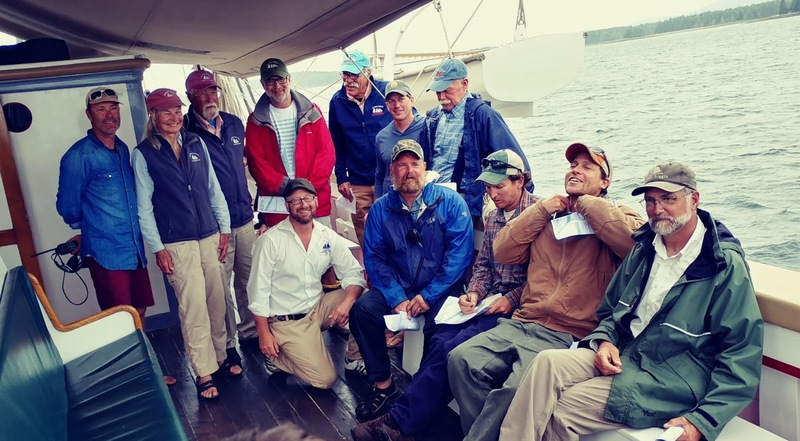 Participating captains gather at the Captain’s Meeting aboard Victory Chimes prior to the 43rd Annual Great Schooner Race. Photo courtesy of Maine Windjammer Association. 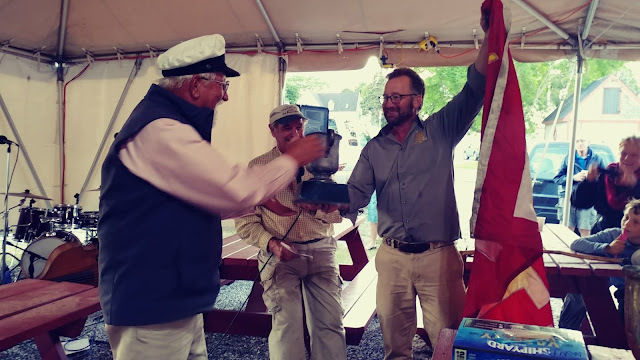 Captain of the Stephen Taber, Noah Barnes, presents Captain of the Schooner Heritage with the Cutty Sark Award trophy and accompanying “Eat My Wake” flag during the Great Schooner Race Awards on July 6, 2018. 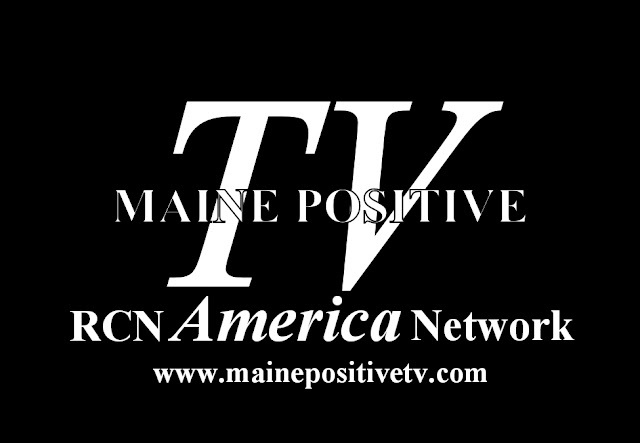 Photo courtesy of Maine Windjammer Association. There was serious competition among the competing boats, which hailed from Rockland, Camden and Newport, RI harbors. Considered by many as the largest annual gathering of traditional historic schooners in America, wind and wits dictated the following results from the 43rd Annual Great Schooner Race. Additional awards were given for seamanship and navigational skills. The Boyd Guild Award, named after the colorful Captain Boyd Guild and recognizing navigational excellence went to the Schooner Tree of Life, captained by Paul Morse, homeport: Newport, RI. Windjammer fans will have another opportunity to view windjammers under full sail as they enter Rockland Harbor during the Annual Parade of Sail, scheduled for Friday, July 13th. Best viewing will be from the Rockland Breakwater as the boats sail past from 2:00-4:00pm. Tour the Rockland Breakwater Lighthouse and enjoy lively commentary by windjammer historian, Jim Sharp of the Sail Power & Steam Museum. The Great Schooner Race is presented annually by the Maine Windjammer Association, representing eight traditional Maine tall ships, ranging in size from 64 to 132 feet on deck. Half of the windjammers are National Historic Landmarks. All of the vessels are privately owned and operated. For more information on the Maine Windjammer Association and windjammer cruises in Penobscot Bay, visit www.SailMaineCoast.com.